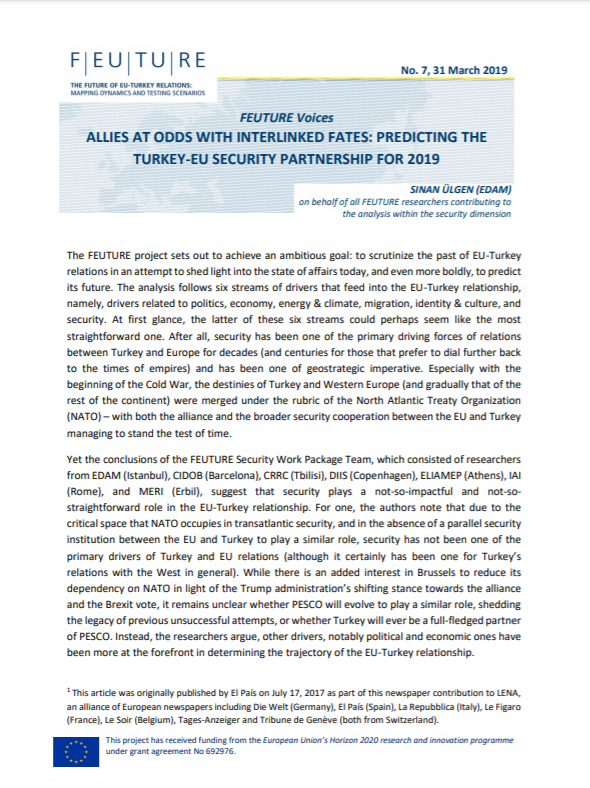 The FEUTURE project sets out to achieve an ambitious goal: to scrutinize the past of EU-Turkey relations in an attempt to shed light into the state of affairs today, and even more boldly, to predict its future. The analysis follows six streams of drivers that feed into the EU-Turkey relationship, namely, drivers related to politics, economy, energy & climate, migration, identity & culture, and security. At first glance, the latter of these six streams could perhaps seem like the most straightforward one. After all, security has been one of the primary driving forces of relations between Turkey and Europe for decades (and centuries for those that prefer to dial further back to the times of empires) and has been one of geostrategic imperative. Especially with the beginning of the Cold War, the destinies of Turkey and Western Europe (and gradually that of the rest of the continent) were merged under the rubric of the North Atlantic Treaty Organization (NATO) – with both the alliance and the broader security cooperation between the EU and Turkey managing to stand the test of time. Yet the conclusions of the FEUTURE Security Work Package Team, which consisted of researchers from EDAM (Istanbul), CIDOB (Barcelona), CRRC (Tbilisi), DIIS (Copenhagen), ELIAMEP (Athens), IAI (Rome), and MERI (Erbil), suggest that security plays a not-so-impactful and not-so-straightforward role in the EU-Turkey relationship.